Abbildungen: ca. 1.600 col. ills. 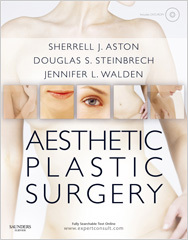 Aesthetic Plastic Surgery - edited by Sherrell J. Aston, MD, Douglas S. Steinbrech, MD and Jennifer L. Walden, MD - brings you the masterful expertise you need to achieve breathtaking outcomes for every cosmetic surgery procedure, including MACS lift, endoscopic mid and lower face rejuvenation, lid/cheek blending - the tear trough, cohesive gel breast augmentation, lipoabdominoplasty, and many more. A &#8222;who&#8216;s who&#8220; of international authorities in plastic surgery explain their signature techniques, giving you all the know-how you need deliver the exceptional results your patients demand. Operative videos on DVD let you observe these techniques being performed in real time; and Expert Consult online access enables you to reference the text, download the images, and watch the videos from any computer. • Coverage of hot topics includes MACS lift, endoscopic mid and lower face rejuvenation, lid/cheek blending - the tear trough, the newest rhinoplasty techniques, cohesive gel breast augmentation, fat grafting techniques, details of the latest injectables and fillers, and many other highly sought-after procedures. • Operative videos - on DVD and online - let you see how leading experts perform more than 50 important techniques, including extended SMAS face lift, traditional inverted-T breast augmentation, and lipoabdominoplasty. • Nearly 1600 full-color photographs and illustrations demonstrate what to look for and what results you will achieve. • A consistent, extremely user-friendly organization guides you through history, evaluation, anatomy, technical steps, post-operative care, complications, and pearls and pitfalls for each procedure - giving you all the advice you need to make informed, effective decisions and avoid complications and disappointing results. • Expert Consult online access allows you to reference the complete contents, perform rapid searches, download the images, and watch the operative videos from any computer.